If you're a lover of beauty, chances are you've heard something about the Anastasia Subculture palette. It's the first time I've ever seen a palette divide the beauty community so much. There are very mixed reviews, and we will discuss not only my experience, but the experience of others with this palette, to be fair. 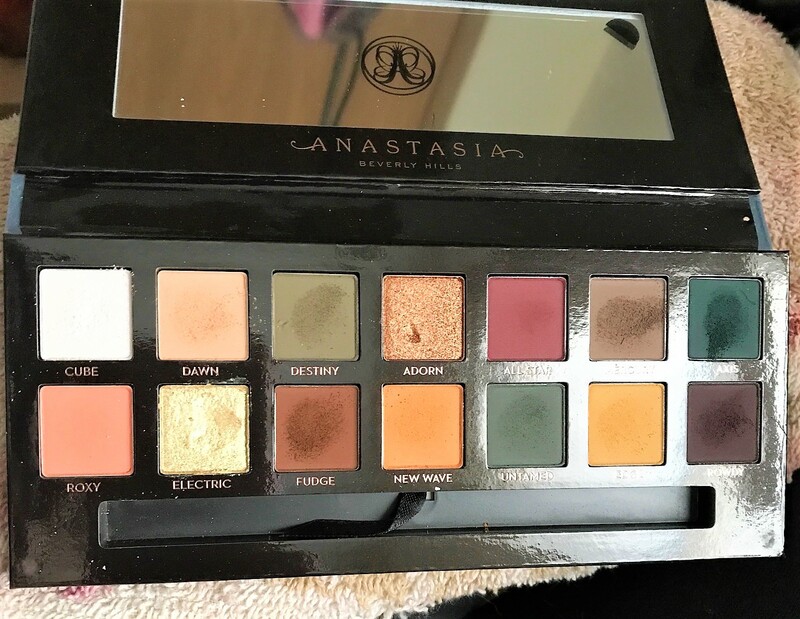 The Anastasia Subculture palette has come with a bucket load of controversy. Normally, I try to stay out of it, but I had no idea it would be like this when I ordered the palette the moment it launched. After having such a great experience with the Modern Renaissance palette, I didn't hesitate to buy Subculture. It looked like it would be the perfect fall palette and I liked the more challenging color scheme of this palette. I've used this palette since it arrived and I've posted swatches and a few looks with it already. I'll include all of those in this post. When the palette first arrived, I opened it up immediately. All of the shadows were in perfect condition. The palette has the same velvet-y exterior as Modern Renaissance, but it's teal. It's cute packaging, but it gets dirty so quickly. My Modern Renaissance palette looks filthy. This palette also came with a dual-ended brush, as usual. I actually use the brushes that come with these palettes, but many people choose not to. The color scheme is unusual. Upon first glance, it appears that the colors are all so different that you couldn't get many looks with this palette, but if you like color, this couldn't be less true. There is a nice mix of warm, neutral, and cool tones. Also, the majority of the palette is matte, which I can appreciate. These are listed as extremely soft-pressed to get the most pigment possible for these shades. However, this results in more fallout and kick back than normal shadows. They act more like pressed pigments than eyeshadows, and that is something to keep in mind. As far as the mattes go, you barely need to touch your brush to these colors. They're super pigmented and if you get too much on your brush, you will have an unblendable mess. Then there are the duochrome & metallic shades. The duochromes especially are much drier and pressed harder. These definitely need a base underneath to be intense, but they can also be layered and will give a nice effect. I use Too Faced Glitter Glue underneath them so they really pop and stay put throughout the day, since I have hooded lids and shimmers tend to transfer into my crease. So, all that being said, I haven't had many issues with this palette. As I mentioned, the Cube & Electric are pretty dry, but that isn't a problem for myself as I always use a sticky base with shimmers. Rowdy didn't give me any issues but it looks more black than purple and I was hoping for more of the purple tones to show up. Mercury can be a little tough to blend. I'm not sure what it is with this particular shade, but it's much harder to blend out than the other shades. I can make it work, but it does need a little extra blending time. As far as kick up and fall out go, I don't find that it's much different than Modern Renaissance. It might be ever so slightly more powdery, but it's really not a big deal. Let's get into the controversy now. The initial wave of PR went out and the palette had a lot of positive reviews. This definitely hyped the palette up, so much so that the Anastasia Beverly Hills website crashed shortly after launch. Over the next day or two, reviews from other YouTubers and vloggers started to appear, and these were less than stellar reviews. This, of course, caused panic and uproar across the beauty community. There were reviews posted showing extremely powdery shadows. There were people swirling their brushes into the shadows, all the way to the bottom of the pan. They were showing the application and you could see the eyeshadow sticking in some places and blending into nothing in other places. Another thing that was happening was the eyeshadows seemed to be oxidizing and getting darker. So as I mentioned above, this caused the majority of the people who follow these vloggers to declare Subculture a horrible palette, when it fact they hadn't tried it. Obviously, it's fine to try something and have a bad experience. It's not okay to jump on the bandwagon when you haven't even tried it. Do I think some of the palettes are bad? Yes, 100%. Norvina said that there was a pressing issue that caused inconsistencies between the palettes. She is currently at the lab trying to figure out what went wrong so she can fix the problem. Defective palettes can be returned for a full refund. This eyeshadow palette is not for a beginner. It is not foolproof. Here are a few looks I did with this palette. My lash was trying to escape from my inner corner in the look on the left. Prime your lids and set your primer well. These shadows will stick to primer and refuse to blend if you haven't set your primer properly. They also seem to oxidize if you don't set your primer. Lightly touch the shadow with your brush. I do mean lightly. I cannot stress this enough. There is no need for dipping multiple times or swirling your brush around like an animal. The lightest touch will work the best and make it the easiest to blend. Do not apply too much shadow at once. As I mentioned before, you only need the slightest bit at a time. These are so much more pigmented than you would expect and applying too much at once makes it really difficult to blend. Use a sticky base with the shimmery shades. Apply these last and apply them over a sticky base if you want them to show up intensely. Use a flat, stiff brush with them for the best results. Be patient. Because these shadows are more pigmented than normal shadows, you will need to spend more time blending. These do behave like pressed pigments. Don't buy this palette if you're a beginner. There is a learning curve to these shadows. As I said, they are not fool proof. Using the correct brushes and techniques is a must with these. I also recommend that you don't travel with this palette. Though Norvina stressed that they are drop tested, they're just so soft. I wouldn't risk putting them in your luggage. If you must take it, take it in your purse and yes I'm serious. This palette is a bit higher maintenance. I do not regret buying it. If you have a defective palette, please return it. They will give you a full refund and you can either repurchase after the issue is corrected or find dupes to your favorite shades. I will include a few below, but for a full list with multiple brands, I recommend checking out Temptalia. I don't have dupes for every color and I don't have exact dupes for a couple, rather shades that give the same effect. 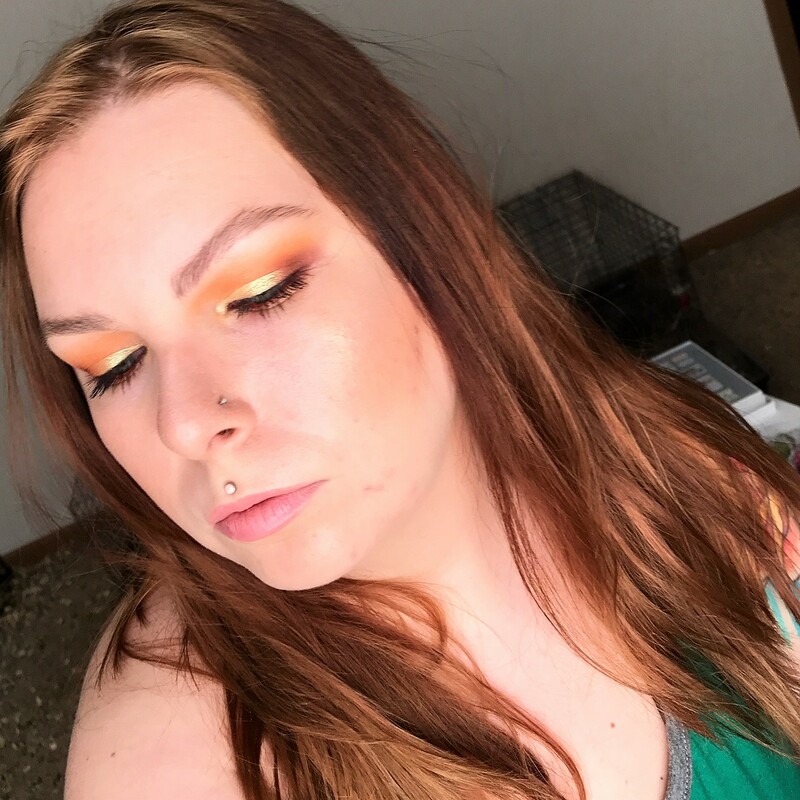 ROWDY - MAKEUP GEEK TABOO - These two shades are almost identical. Taboo is slightly more purple and less pigmented. CUBE - MAKEUP GEEK PHANTOM - ABH PINK HEART - This one was a little tough. Phantom and Cube are not the same color; Phantom is white with a lavender shift. However, it gives the same effect. If you have the ABH Moonchild Palette, Pink Heart is the same as Cube but less pigmented. ELECTRIC - MAKEUP GEEK VOLTAGE - These are also not identical. Voltage is a white base with a golden shift and is actually MORE pigmented than Electric, which is gold with a green shift. However, when applied they will give the same effect and look very similar. DAWN - MAKEUP GEEK PEACH SMOOTHIE - These two are close in color, but Peach Smoothie is lighter and less pigmented. Blended out lightly in the crease, they will give the same effect. NEW WAVE - MAKEUP GEEK CHICKADEE - Chickadee is less pigmented but the color is the same. ALLSTAR - MAKEUP GEEK CHERRY COLA - MAKEUP GEEK BITTEN - None of these are completely identical, but Cherry Cola is almost spot on but less pigmented. Bitten is more red and less pigmented. Blended out, Cherry Cola and All Star look the same. AXIS - MAKEUP GEEK PEACOCK - MAKEUP GEEK ENVY - This is another situation where none of them are identical. Envy is very similar in color, but has a blacker base, less pigment and shimmer. Peacock is much more blue than Axis. MERCURY - URBAN DECAY COVER - URBAN DECAY FAINT - Cover is lighter and Faint has slightly more yellow undertones. Blended out, the effect is the same. FUDGE - MAKEUP GEEK MOCHA - ABH FUDGE(SHADOW COUTURE) - Mocha is ever so slightly more cool toned than Fudge and less pigmented. Fudge from the Shadow Couture palette is less pigmented and has slight plum undertones, which is odd since they're the same shade. I couldn't find shades in my collection to dupe the others. Roxy is similar to Colourpop Cut Outs, but Cut Outs was a little brighter and more coral, so I didn't think they were close enough to call it a dupe. The other shades I couldn't dupe in my collection, but as I said, Temptalia has all of them duped with multiple brands, so check hers out. Lastly, I wanted to show the colors applied to my hand with a brush. The matte shades are dipped into the palette one time and blended onto my hand. The shimmer shades are applied with a flat brush, one swipe. You can clearly see All Star, Rowdy, Roxy, Destiny, and Edge in the first picture. Electric and Cube are in the second. Adorn is in the third. Dawn, Mercury, Fudge, Axis, Untamed, Rowdy, Roxy and Edge are in the fourth. The colors were a little brighter in person, but this was mostly to show that they blend and are pigmented. Overall, I'm enjoying this palette. I think I'll be using it a lot, especially this fall because these shades are perfect for Autumn. Do I recommend picking it up? Maybe. Go to a store and swatch it. It's permanent, so it's not going anywhere. With there being an inconsistency in the quality of the palette, I can't tell you to go buy it, even though I love it. I don't want to tell you to buy it and then you end up with a faulty palette that you have to return. If you want it, buy it. Mine is beautiful. Others haven't had such a great experience. Norvina is working with the lab now to figure out why there is an inconsistency and remedy it. You might want to wait on reformulation. This palette retails for $42 and is available from Anastasia's website, Ulta, Sephora and Beautylish. I believe it will be in stores around the 15th.